BBB-LCD-Audio-Exif is an expansion board designed by HAOYU Electronics for BeagleBone family to connect 24-bit LCD displays. Supports LCD Module such as HY070CTP-HD. Full-featured for the WM8960 stereo audio codec. 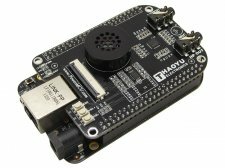 Can be used on Beagleong black and BeagleBone. Powered by BeagleBone Black or BeagleBone directly without need of external power supply. Mounting holes ensure a reliable assembly of BBB-LCD-Audio-Exif and BeagleBone Black by using brass tube plugs and nuts. The LCD interface definitions are as same as that of MarsBoard single board computers such as MarsBoard A20 and MarsBoard RK3066, MarsPI, which means it is fully compatible with the hardware design of these single board computers. one headphone Out,one speaker, one Mic In ( not soldered ), one Line in.